We bring forth superior quality Frozen Chicken Wings procured from the trusted sources of the market. Extracted from the disease-free chicken, our Frozen Chicken Wings are properly cleaned and processed under the most hygienic conditions before freezing. Furthermore, we store Frozen Chicken Wings in required temperatures to ensure that the natural taste and texture of the meat would remain the same. 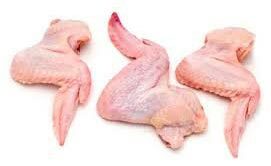 Furthermore, we provide Frozen Chicken Wings in quality packaging of drugstore or butcher wrap.